1. Roll up the ham slices and cut across into 1cm-wide strips. Place in a bowl with the Cheddar and herbs, and toss well together. 2. Beat together the eggs and crème fraîche, then stir in the grated courgette. 3. Heat half the butter in a 23cm non-stick frying pan. Pour half the beaten egg mixture into the pan. Allow to cook a little on the bottom then gently pull the sides inwards with a spatula, letting more egg run outwards to fill the space inside the pan. Cook until just set. 4. Scatter with half the ham and cheese mix then fold over and cook for a further minute until just done. 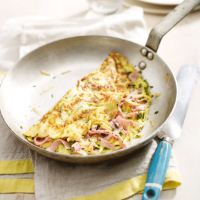 Transfer to a warm plate and repeat to make a second omelette. Serve with mixed salad. Try mixing up the flavour by swapping the Cheddar for nutty Gruyère or creamy mozzarella. Or add a little wholegrain mustard in with the crème fraîche.